Jim is an experienced Executive with over 20 years in the Enterprise Software, Life Sciences, Healthcare, and Manufacturing industry. He leads the T-Systems North America Healthcare and Life Sciences vertical. He has been engaging with clients on DIGITAL TRANSFORMATION through numerous projects leveraging: Cloud, Big Data, and IoT. 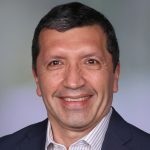 He has a background and experience in Clinical Development; Supply Chain Management; Manufacturing; CRM (Sales and Service); IoT; Big Data / Analytics; Cloud Computing; Blockchain, and Regulatory Standards. He is leading the effort for applying IoT for various businesses that use SAP, Oracle and Microsoft solutions. The function of the IoT Community, is to focus on the adoption & application of IoT in commercial environments, seeking to understand & contribute to applying the technology or overcoming the wide variety of barriers, inhibitors, and technical & operational issues. As a member of the board, Jim will provide impartial input and guidance to the overall vision, strategy and execution that is helping to shape the current and future direction for the IoT Community, as well as the broader IoT industry.